After years of unabated growth, social media is waning globally -- especially in the U.S. -- as a source of news, and most of the declines are attributable to less consumption of and referrals from Facebook. The findings, which are part of the 2018 edition of a comprehensive annual study released today from the Reuters Institute for the Study of Journalism, show that “direct” access to publishers’ sites still is the No. 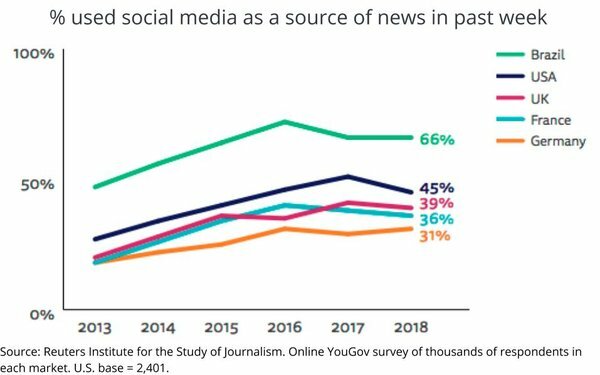 1 way that people source news, with 32% of news consumers citing it, followed by search (24%), social (23%), email, mobile apps and news aggregators (6% each). The study shows variances by market and age, with younger consumers relying more on social media vs. older people accessing publishers directly. 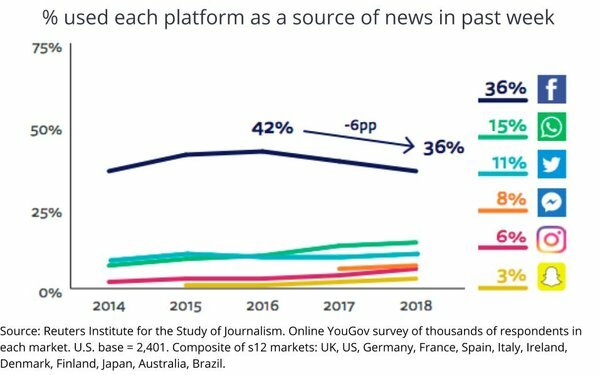 “For the last seven years we have tracked the key sources for news across major countries and have reported a picture of relentless growth in the use of social media for news. Now, in many countries, growth has stopped or gone into reverse,” reads the report. “Taking the United States as an example, weekly social media use for news grew steadily from 27% in 2013 to a peak of 51% before falling back significantly this year to 45% (-6). To some extent this represents a readjustment after the social media frenzy around the Trump inauguration last year – but these patterns also exist elsewhere. In the UK usage grew from 20% in 2013 to 41% in 2017 before falling back. The decline in Brazil appears to have started in 2016. Reuters' polling, which surveyed thousands of users in each market via YouGov's online surveys, was conducted mostly before the implementation of Facebook's algorithm change in January 2018, which places a much greater weight on "meaningful interactions." 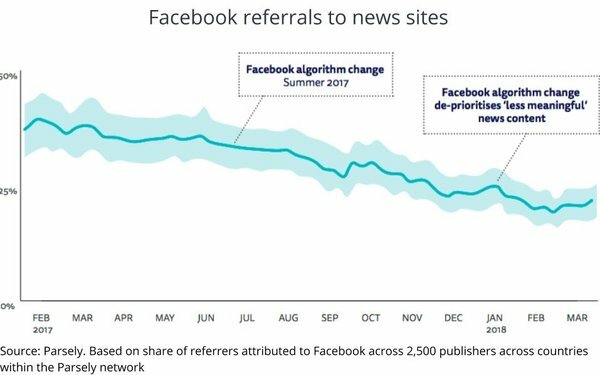 "Since then, a number of publishers have reported a further substantial decline in referrals," the report finds, adding: "One publisher, Little Things, went out of business in early 2018, citing Facebook’s algorithm changes as a critical factor."